Choral Evensong is almost timeless in its stretching of the soul toward the Holy as word and music trace a path that (as Keats' might have put it,) "dost tease us out of thought/ as doth eternity". 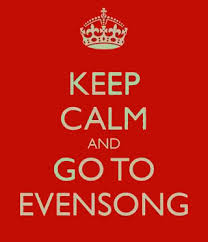 Well, that's a way of describing what Evensong does. Tourists came in during the service, and went, and stayed, and lingered afterwards - not just the wanderers with a camera, but many who heard and felt something of eternity in the liturgy and cherished it. At one point there would have been about 30+ strangers in the pews. One recalls the naysayers who dismiss Cathedral music, liturgy and spirituality as irrelevant to the 'modern world' - they could not be more wrong. Father, Son and Holy Spirit, Amen.